[S269] C. W. Previté-Orton sCMH I, pg. 78, genealogy table 3..
[S862] Various EB CD 2001, Marcian (emp. of Rome). [S911] Hadrian to Islam, online http://users.iafrica.com/l/ll/lloyd/1-TimeLine/…..
Justa Grata Honoria Augusta was born in 417. 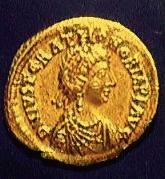 She was the daughter of Constantius III, imperator and Galla Placidia the elder, augusta. Justa Grata Honoria Augusta was apprehended in a love affair with the overseer of her estates circa 449 at Rome, Italy. Both supposedly were engaged in a plot to seize power for Honoria. As a result, her lover was executed and she was exiled to Constantinople. She was appealed for help to Attila the Hun circa 450 at Constantinople, Byzantium. Attila chose to interpret Honoria's missive as a marriage proposal, and demanded half of the western Roman Empire as her dowry. Attila's ultimatum was refused, and he responded by invading the western empire in 451 and 452.1 She married Flavus Bassus Herculanus before 455. Justa Grata Honoria Augusta died circa 455. Horsa, King of Kent was born circa 424 at Denmark. He was the son of Wihtgils (Anglo-Saxon Myth). Horsa, King of Kent was a witness where Hengest, King of Kent (Anglo-Saxon Myth) leader of the Jutes, along with his brother Horsa, who came to settle in England, landing in 446 at Ebbsfleet, Kent, England.1,2 Horsa, King of Kent was a witness where Hengest, King of Kent (Anglo-Saxon Myth) fought for the British king, Vortigern, as a mercenary against the Picts between 446 and 454. Co-Ruler of Kent at England between 449 and 455.3 Horsa, King of Kent died in 455 at Aylesford, Kent, England. [S216] Ingram's Edition, The Anglo-Saxon Chronicle. [S335] Donnchadh Ó Corráin, Rawl. 502, 1686. [S451] Leslie Mahler, later roman empire in "later roman empire," listserve message 05/02/1998. [S862] Various EB CD 2001, Valentinian III (Roman emp.) . [S862] Various EB CD 2001, Honorius. [S585] Transcribed by Douglas J. Potter The Catholic Encyclopedia, Vol V, Eudocia. [S176] Christian Settipani & Patrick van Kerrebrouck, Capetiens 481-987, pg. 49. [S429] John Sweetman, Dictionary of European Battles, pg. 47. [S862] Various EB CD 2001, Maximus, Petronius (Roman emp.) . Eudokia "the Younger" b. circa 440? [S233] DIR, online http://www.roman-emperors.org/impindex.htm, Petronius Maximus (17 March 455 - 22 May 455). [S862] Various EB CD 2001, Avitus (Roman emp.) . [S1650] Christian Settipani, Settipani-Continuite Addenda, I, pg. 13. [S862] Various EB CD 2001, Avitus (Roman emp.) - EB says Avitus was the son-in-law of the Christian writer, but chronologically, and per other source, he was actually the father-in-law of Sidonius..
[S227] Bishop of Tours Gregory, GT, bk II, ch. 7. [S233] DIR, online http://www.roman-emperors.org/impindex.htm, Julius Nepos . 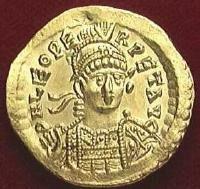 [S862] Various EB CD 2001, Theodosius II (Roman emp.). [S1228] Coins and history, online www.grifterrec.com. [S204] Roderick W. Stuart, RfC, 408-53. [S204] Roderick W. Stuart, RfC, 408-52. [S262] MS Encarta 99, "Persia," Microsoft® Encarta® Encyclopedia 99. © 1993-1998 Microsoft Corporation. All rights reserved..
[S1628] Unknown author Encyclopædia Iranica, III:518. [S1035] Robert Bedrosian (translator), HoA : P'arpec'i's (5th C). [S590] Hye Etch, online http://www.hyeetch.nareg.com.au/armenians/history_p1.html, The Vartanank War, The interregnum (428-861) . [S323] Robert Bedrosian, "in Armenia". [S1035] Robert Bedrosian (translator), HoA : P'arpec'i's (5th C), Part 3, Ch. 60 - [i P'arssum. The editors, in note 2 p. 108 express doubt about this reading]. [S589] Robert Bedrosian (translator), HoA: Sebeos' (7th C), Chapter 1. [S1035] Robert Bedrosian (translator), HoA : P'arpec'i's (5th C), Part 3, Ch. 60. [S592] Mike Ashley, Ashley, M., [FA2]. [S592] Mike Ashley, Ashley, M., Chart 6. Celts (3) - The Picts. [S204] Roderick W. Stuart, RfC, 303-53. [S218] The Oxford Merovingian Page, online ..
[S176] Christian Settipani & Patrick van Kerrebrouck, Capetiens 481-987, pg. 47. [S278] DfAdam, online unknown url, The Line of Helenus, King of Epirus, 98. [S440] Léon van der Essen, Deux Mille, Gen Table I. [S204] Roderick W. Stuart, RfC. [S227] Bishop of Tours Gregory, GT, bk II, ch. 9. [S1105] Margaret Lantry, AMF, MF437.1. [S204] Roderick W. Stuart, RfC, 303-52. [S334] Emma Ryan Vol. 1, Myriam Priour Vol. 2 & 3 and Floortje Hondelink Vol. 4, A4M, M458.1. [S334] Emma Ryan Vol. 1, Myriam Priour Vol. 2 & 3 and Floortje Hondelink Vol. 4, A4M, M444.1. [S334] Emma Ryan Vol. 1, Myriam Priour Vol. 2 & 3 and Floortje Hondelink Vol. 4, A4M, M430.1. [S1445] Francis J. Byrne, Irish Kings and High-Kings, pg. 280. [S333] W. Hennessy, Chronicon Scotorum, Kal. ii. A.D.429. [S333] W. Hennessy, Chronicon Scotorum, Annal CS452..
[S334] Emma Ryan Vol. 1, Myriam Priour Vol. 2 & 3 and Floortje Hondelink Vol. 4, A4M, M453.2. [S334] Emma Ryan Vol. 1, Myriam Priour Vol. 2 & 3 and Floortje Hondelink Vol. 4, A4M, M454.2. [S334] Emma Ryan Vol. 1, Myriam Priour Vol. 2 & 3 and Floortje Hondelink Vol. 4, A4M, M457.2. [S897] [unknown], AU, U462.1, "Grellach Dabhaill or Grellach Ghaifil on the side of Caisse in Magh Life, between two hills called Eiriu and Albu". [S496] Ed. & trans. Seán Mac Airt, AI, AI463.1. [S334] Emma Ryan Vol. 1, Myriam Priour Vol. 2 & 3 and Floortje Hondelink Vol. 4, A4M, M432.3. [S334] Emma Ryan Vol. 1, Myriam Priour Vol. 2 & 3 and Floortje Hondelink Vol. 4, A4M, M479.1. [S1082] Brenin Powys Cyngen ap Cadell o Powys, Eliseg's Pillar, (E-text by Jeff Davies, translator). [S665] Vortigern Studies, online www.vortigern.org. [S624] Geoffrey of Monmouth, Geoffrey of Monmouth, Book VIII, Chapt. 13. [S624] Geoffrey of Monmouth, Geoffrey of Monmouth, Book VI, Chapt. 12. [S624] Geoffrey of Monmouth, Geoffrey of Monmouth, Book VIII, Chapt. 2. [S277] Gene Gurney, Kingdoms of Europe, pg. 430, Denmark. [S261] Regnal Chronologies, online http://www.hostkingdom.net/regindex.html, Scandanavia, Denmark. [S585] Transcribed by Douglas J. Potter The Catholic Encyclopedia, Vol V, Eudocia, circa 460. [S646] St. Patrick's Family Tree, online sites.rootsweb.com. [S334] Emma Ryan Vol. 1, Myriam Priour Vol. 2 & 3 and Floortje Hondelink Vol. 4, A4M, M493.3. [S334] Emma Ryan Vol. 1, Myriam Priour Vol. 2 & 3 and Floortje Hondelink Vol. 4, A4M, M447.2. [S334] Emma Ryan Vol. 1, Myriam Priour Vol. 2 & 3 and Floortje Hondelink Vol. 4, A4M, M493.2. [S862] Various EB CD 2001, "Patrick, Saint". [S310] John O'Hart, Irish Pedigrees, Vol I, pg. 70. [S592] Mike Ashley, Ashley, M., [FB1]. [S334] Emma Ryan Vol. 1, Myriam Priour Vol. 2 & 3 and Floortje Hondelink Vol. 4, A4M, M457.3. [S592] Mike Ashley, Ashley, M., [FC1]. [S203] R. F. Tapsell, Royalty of the World, 184.3 (S2), pg. 376. [S203] R. F. Tapsell, Royalty of the World, 184.2 (S1), pg. 376. [S954] Esq., Bengal Civil Service William Muir Muir on Mahomet, Vol. 1, Chap. 3, Sect. 2. [S203] R. F. Tapsell, Royalty of the World, 184.4 (S3), pg. 376. [S203] R. F. Tapsell, Royalty of the World, 184.5 (S3), pg. 376. [S75] Herwig Wolfram, Wolfram, 1979, pg. 202, d.s.p..
[S75] Herwig Wolfram, Wolfram, 1979, pg. 203. [S231] Ian Wood, The Merovingian Kings, pg. 16. [S713] Herwig Wolfram, Wolfram, 1997, pg. 23, figure 1. [S278] DfAdam, online unknown url, The Line of Caradoc, Lord of Meiriadog, 77. [S624] Geoffrey of Monmouth, Geoffrey of Monmouth, Book VI, Chapt. 4. [S278] DfAdam, online unknown url, The Line of Conall Gulban mac Néill, 100. [S334] Emma Ryan Vol. 1, Myriam Priour Vol. 2 & 3 and Floortje Hondelink Vol. 4, A4M, M464.3. [S334] Emma Ryan Vol. 1, Myriam Priour Vol. 2 & 3 and Floortje Hondelink Vol. 4, A4M, M465.3. [S278] DfAdam, online unknown url, The Line of Conall Gulban mac Néill, 101. Some of the clans of the Cenél Eóghain included those of Clan Neill, Clan Domnaill, Clan Birn, Cenél Fergusa, Cairrge Brachaidhe, Cenél Binnigh, Cenél Moen, Cenél Fearadhaigh, Cenel Tigernaich, Clan Conchobhair, Clan Diarmatta. Eoghan's sons included Muiredach, Binech, Fergus, Óengus, Dallán, Cormac, Feideilmid, Ailill, Echen, Illann, and Eochaid. Éogan Find a quo Cenél nEógain, rí Ailech was born. The 4th son. Eoghan was the son of Niall who established his kingdom in Innishowen, centered at Aileach. He was ancestor of Cenél Eóghain.1 He was the son of Niall Noígiallach a quo Uí Néill, Ard-rí na h'Éireann and Ine ingen Dubthaig.1,2,3 Éogan Find a quo Cenél nEógain, rí Ailech was personnally baptised and nicknamed "the Lion" Eogan MacNiall by St. Patrick circa 442. He witnessed the death of Conall Gulban a quo Cenél Conaill, rí Tir Conaill in 464; Slain by the old tribes of Magh Slecht having been found unprotected.4 1st King of Ailech at Ireland before 465.5 Éogan Find a quo Cenél nEógain, rí Ailech died in 465. He died of grief for Conall Gulban, son of Niall of the Nine Hostages, his brother.1,6 Annals of Ulster 465: "Eógan son of Niall died. / Eogan mc. Neill mortuus est. "6 Annals of the Four Masters 465: "Eoghan, son of Niall of the Nine Hostages (from whom are descended the Cinel Eoghain), died of grief for Conall Gulban, son of Niall of the Nine Hostages, and was buried at Uisce Chain, in Inis Eoghain; concerning which was said: / Eoghan, mac Neill Naoighiallaigh, (ó t-tatt Cenel n-Eoghain), d'écc do chumhaidh Chonaill Ghulban, mic Neill Naoighiallaigh, & a adhnacal i n-Uisge Chaoín i n-Inis Eoghain, dia n-ebradh. [S335] Donnchadh Ó Corráin, Rawl. 502, ¶1014]. [S1445] Francis J. Byrne, Irish Kings and High-Kings, pg. 283. [S334] Emma Ryan Vol. 1, Myriam Priour Vol. 2 & 3 and Floortje Hondelink Vol. 4, A4M, M504.1. [S334] Emma Ryan Vol. 1, Myriam Priour Vol. 2 & 3 and Floortje Hondelink Vol. 4, A4M, M465.4. [S335] Donnchadh Ó Corráin, Rawl. 502, 5. [S483] Stewart Baldwin, Llywelyn ap Iorwerth's ancestors in "Baldwin-Llywelyn," listserve message Dec 1998. [S335] Donnchadh Ó Corráin, Rawl. 502, 21. [S278] DfAdam, online unknown url, The Line of Labraid mac Bresail, 99. [S334] Emma Ryan Vol. 1, Myriam Priour Vol. 2 & 3 and Floortje Hondelink Vol. 4, A4M, M478.1. [S483] Stewart Baldwin, Llywelyn ap Iorwerth's ancestors in "Baldwin-Llywelyn," listserve message Dec 1998, This date is well before contemporary annalistic recording in Ireland, and is to be taken with a grain of salt..
"You have often begged a description of Theodoric the Gothic king, whose gentle breeding fame commends to every nation; you want him in his quantity and quality, in his person, and the manner of his existence. I gladly accede, as far as the limits of my page allow, and highly approve so fine and ingenuous a curiosity. [S269] C. W. Previté-Orton sCMH I, pg. 132, genealogy table 4..
[S228] Jordanes, Jordanes' Getica, XIV-80. [S713] Herwig Wolfram, Wolfram, 1997, pg. 24, figure 2. [S253] Peter Heather, Heather, P., pg. 114. [S1642] Ford Mommaerts-Browne < and e-mail address>, [GEN-ANCIENT] A Speculation in "[GEN-ANCIENT] A Speculation," newsgroup message Mon, 8 Mar 2004 00:14:15 -0600. [S962] Sidonius Apollinaris, Letters of Sidonius (orig. ), pp. clx-clxxxiii; List of Correspondents. [S920] ., "Babylonian Exilarchs Tree," e-mail to Robert Brian Stewart (91), Thursday, May 17, 2001 6:27 PM. [S261] Regnal Chronologies, online http://www.hostkingdom.net/regindex.html, Mesopotamia & Arabia, the Resh Galuta. [S422] Thomas S. Burns, History of the Ostrogoths, pg. 96-97. [S862] Various EB CD 2001, (Roman emp.) (from Table of Roman Emperors). [S862] Various EB CD 2001, Anthemius (Roman emp.). [S302] Jean-Michel Pognat, "Brittany: Many Kingdoms or One?". [S231] Ian Wood, The Merovingian Kings, Pg. 14. [S862] Various EB CD 2001, Ricimer (Roman gen.). [S75] Herwig Wolfram, Wolfram, 1979, pg. 33. [S862] Various EB CD 2001, Olybrius (Roman emp.) . [S1196] Historia Francorum, online http://hbar.phys.msu.su/gorm/chrons/georflor.htm, XVII. [S231] Ian Wood, The Merovingian Kings, Pg. 15. [S176] Christian Settipani & Patrick van Kerrebrouck, Capetiens 481-987, pg. 67. [S862] Various EB CD 2001, Clotilda, Saint. [S204] Roderick W. Stuart, RfC, 165-52. [S206] With additions and corrections by Walter Lee Sheppard, Jr. and assisted by David Faris Frederick Lewis Weis, Weis: AR 7th ed., 170-1. [S278] DfAdam, online unknown url, The Line of Fiachu Fer Mara, 111. [S334] Emma Ryan Vol. 1, Myriam Priour Vol. 2 & 3 and Floortje Hondelink Vol. 4, A4M, M474.2. [S335] Donnchadh Ó Corráin, Rawl. 502, RÍG ALBAN. 1697. [S298] HRH Prince Michael of Albany, Albany, pg. 16. [S334] Emma Ryan Vol. 1, Myriam Priour Vol. 2 & 3 and Floortje Hondelink Vol. 4, A4M, M498.2. [S592] Mike Ashley, Ashley, M., Chart 9. Scotland (1) - Dál Riata. [S268] Nora K. Chadwick, Celtic Britain, pg. 59. (c)1998 Edgar L. Owen, Ltd.
[S862] Various EB CD 2001, Leo I (Roman emp.). [S862] Various EB CD 2001, Leo II (Roman emp.). [S324] Robert Bedrosian (translator), The Georgian Chronicle (from Armenian), Chap. 14. [S1163] John FR Wright, Tbilisi, pg. 27. [S1163] John FR Wright, Tbilisi, pg. 29. [S1186] Robert W. Thomson (translator), The Georgian Chronicle, pg. 227, Geo..
[S1163] John FR Wright, Tbilisi, pg. 26-27. [S1164] Ronald Grigor Suny, Suny, pg. 23. [S1186] Robert W. Thomson (translator), The Georgian Chronicle, pg. 227, d. 475. Conall Cremthainne, rí Mide was ancestor of the Kings of Brega and the Kings of Uinech (Ulster) who formed the principal branch of the southern Ui Niall (children of Niall) that alternated with the northern Ui Niall as Kings of Ireland.4 1st King of Mide at the Middle Kingdom, Ireland. He was born. The 2nd son.4 He was the son of Niall Noígiallach a quo Uí Néill, Ard-rí na h'Éireann and Rígnach ingen Meadaib.1,2,3 Conall Cremthainne, rí Mide was ancestor of the Clann Colmain, and race of Aedh Slaine.1 He was the ancestor of Suibne mac Colmáin, rí Midi; son of Colmán Mór son of Diarmait Derg son of Fergus Cerrbél son of Conall of Cremthann son of Niall Naígiallach.5 Conall Cremthainne, rí Mide was the ancestor of Áed Sláine mac Diarmata, rí Bregh, Ard-rí na h'Éireann; son of Diarmait Derg son of Fergus Cerrbél son of Conall of Cremthann son of Niall Naígiallach.6 Conall Cremthainne, rí Mide was the father of Ardgal a quo Cenél nArdgail; the son of Conall Creamhthainne, son of Niall.7 Conall Cremthainne, rí Mide died in 475 or 480.1,8 Annals of the Four Masters 475: "Conall Cremhthoinn, son of Niall of the Nine Hostages, from whom are sprung the Clann Colmain, and race of Aedh Slaine, died. / Conall Cremhthoinn, mac Nell Naoighiallaigh, or chinset Clanna Colmain & Síol Aodha Slaine d'écc." ( (an unknown value)).1 Annals of Ulster 480: "Death of Conall of Cremthann, son of Niall. / Mors Conaill Cramthainne mc. Neill. "8 He was the predecessor of Fiachu a quo Cenél Fiachach, rí Midi; 2nd King of Mide. [S334] Emma Ryan Vol. 1, Myriam Priour Vol. 2 & 3 and Floortje Hondelink Vol. 4, A4M, M475.2. [S335] Donnchadh Ó Corráin, Rawl. 502, ¶954]. [S278] DfAdam, online unknown url, The Line of Conall Cremthainne mac Néill, 100. [S334] Emma Ryan Vol. 1, Myriam Priour Vol. 2 & 3 and Floortje Hondelink Vol. 4, A4M, M513.3. Gaiseric, King of the Vandals was related to Huneric, King of the Vandals; son of Gaiseric, King of the Vandals.3 The name "Gaiseric" means "Caesar-King". 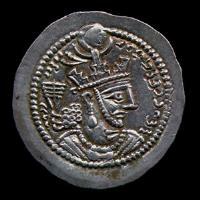 Also called Genseric.3 Gaiseric, King of the Vandals also went by the name of "The Rod of God". He was born circa 389 at Hungary. He was the son of Godegisel, King of the Vandals and unfree woman (? ).2 King of the Vandals at Spain between 419 and 428. Gaiseric, King of the Vandals succeeded his brother Gunderic in 426 at Baetica (modern Andalusia), Spain.3 King of the Alans between 428 and 477.3 He was orchestrated a mass move of his people, purported to number some 80,000, to Maghrib (North Africa) in May 428. Evidently he was invited to Africa by the governor, Count Bonifacius, who wished to use the military strength of the Vandals in his struggle against the imperial government.1 He was advanced eastwards in Maghrib and took Hippo Regius in 430. They took the city after a long siege during which St. Augustine died.1 He was turned on Count Bonifacius, and defeated him, in 430 at Maghrib. He then crushed the joint forces of the Eastern and Western empires that had been sent against him.1 He was concluded an agreement with Rome that the Vandal state in Africa became a Federate of Rome in 435.1 King of the Vandals at Maghrib between 439 and 477. He overthrew Roman overlordship and seized the important mediterranean city of Carthage, allowing him to create an independent autocracy, a second power in the mediterranean alongside Rome, on 19 October 439 at Maghrib.3 He was concluded a treaty with Rome in 442. Therein the Vandals were recognized as masters of proconsular Africa, Byzacena, and part of Numidia. Gaiseric was perhaps the most perceptive barbarian king of the 5th century in realizing the total weakness of the empire. Gaiseric's fleet soon came to control much of the western Mediterranean, and he annexed the Balearic Islands, Sardinia, Corsica, and Sicily.1 He was a witness where Licinia Eudokia Theodosia, augusta invited the Vandal Geiseric to Rome in 455.4 Gaiseric, King of the Vandals sacked Rome in June 455 at Italy.1 He defeated the first major Roman effort, led by the Emperor Majorian, to remove him in 460.1 He defeated the second attempt of Rome, led by Basiliscus, to oust him in 468.1 He died on 25 January 477 at Carthage, North Africa. In his life Gaiseric witnessed the Vandals moving from Hungary, through all of Europe, and supervised their entry into, and occupation of, North Africa. [S713] Herwig Wolfram, Wolfram, 1997, pg. 164, figure 3. [S862] Various EB CD 2001, "Gaiseric". Amalberge des Francs was born in 435. She was the daughter of Clodoweg des Francs and Weldelphe of the Saxons. Amalberge des Francs married Childebert, King of the Franks, son of Clovis, King of the Franks and Ildegonde, in 453. Amalberge des Francs died in 478 at age 43 years. [S266] EBK, online http://freespace.virgin.net/david.ford2/…, Aldrien, King of Brittany. [S266] EBK, online http://freespace.virgin.net/david.ford2/…, Erich, King of Brittany. [S278] DfAdam, online unknown url, The Line of Caradoc, Lord of Meiriadog, 78. [S278] DfAdam, online unknown url, The Line of Conall Cremthainne mac Néill, 101. [S334] Emma Ryan Vol. 1, Myriam Priour Vol. 2 & 3 and Floortje Hondelink Vol. 4, A4M, M539.1. [S334] Emma Ryan Vol. 1, Myriam Priour Vol. 2 & 3 and Floortje Hondelink Vol. 4, A4M, 595.1. [S334] Emma Ryan Vol. 1, Myriam Priour Vol. 2 & 3 and Floortje Hondelink Vol. 4, A4M, M459.1. [S1445] Francis J. Byrne, Irish Kings and High-Kings, pg. 298. [S334] Emma Ryan Vol. 1, Myriam Priour Vol. 2 & 3 and Floortje Hondelink Vol. 4, A4M, M463.2. [S496] Ed. & trans. Seán Mac Airt, AI, AI464.1. [S334] Emma Ryan Vol. 1, Myriam Priour Vol. 2 & 3 and Floortje Hondelink Vol. 4, A4M, M464.2. [S334] Emma Ryan Vol. 1, Myriam Priour Vol. 2 & 3 and Floortje Hondelink Vol. 4, A4M, M465.2. [S334] Emma Ryan Vol. 1, Myriam Priour Vol. 2 & 3 and Floortje Hondelink Vol. 4, A4M, M466.2. [S334] Emma Ryan Vol. 1, Myriam Priour Vol. 2 & 3 and Floortje Hondelink Vol. 4, A4M, M470.2. [S334] Emma Ryan Vol. 1, Myriam Priour Vol. 2 & 3 and Floortje Hondelink Vol. 4, A4M, M526.4. [S334] Emma Ryan Vol. 1, Myriam Priour Vol. 2 & 3 and Floortje Hondelink Vol. 4, A4M, M479.3. [S335] Donnchadh Ó Corráin, Rawl. 502, 1693. [S278] DfAdam, online unknown url, The Line of Owain Finddu ap Maxen, 82. [S624] Geoffrey of Monmouth, Geoffrey of Monmouth. [S624] Geoffrey of Monmouth, Geoffrey of Monmouth, Book VIII, Chapt. 19. [S624] Geoffrey of Monmouth, Geoffrey of Monmouth, Book VIII, Chapt. 20. [S278] DfAdam, online unknown url, The Line of Loarn Mór mac Eirc, 100. [S278] DfAdam, online unknown url, The Line of Éogan Find mac Néill, 101.